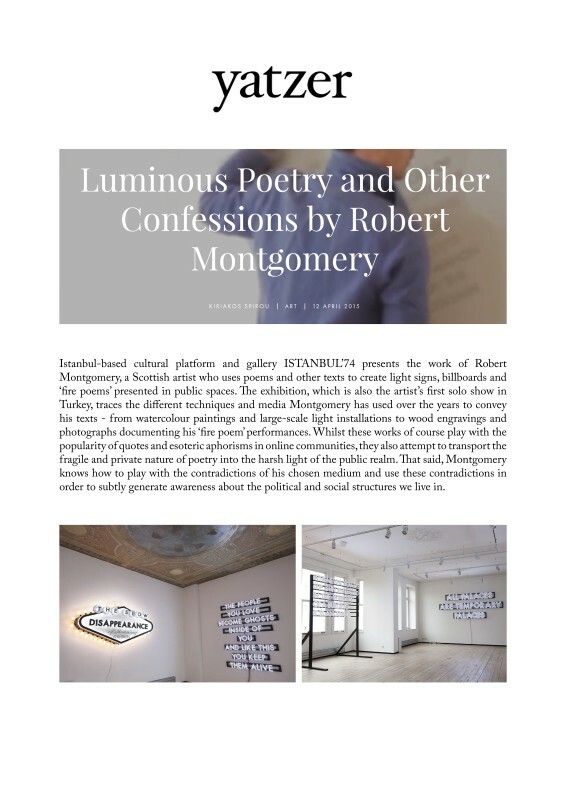 Istanbul-based cultural platform and gallery ISTANBUL'74 presents the work of Robert Montgomery, a Scottish artist who uses poems and other texts to create light signs, billboards and 'fire poems' presented in public spaces. The exhibition, which is also the artist's first solo show in Turkey, traces the different techniques and media Montgomery has used over the years to convey his texts - from watercolour paintings and large-scale light installations to wood engravings and photographs documenting his 'fire poem' performances. Whilst these works of course play with the popularity of quotes and esoteric aphorisms in online communities, they also attempt to transport the fragile and private nature of poetry into the harsh light of the public realm. That said, Montgomery knows how to play with the contradictions of his chosen medium and use these contradictions in order to subtly generate awareness about the political and social structures we live in.